To Cite: Toodehzaeim M H, Mostafavi S M S. Dental Arch Morphology in Iranian Population, Iran J Ortho. 2016 ; 11(2):e5863. doi: 10.17795/ijo-5863. Background: The aim of this study was to verify the prevalence of three different morphologies of the mandibular and maxillary dental arch in natural normal occlusions and that may help guiding orthodontists customizing shape of orthodontic archwires. The orthodontist should know the mean of inter-canine and inter-molar width of Iranian population to help as a guide of treatment. Methods: We examined 132 study models including 66 maxillary and 66 mandibular arches. Three square, ovoid, and tapered templates were overlaid on arches using special software. Samples were categorized according to the adaptability of templates on images. Inter canine and inter molar widths were also measured on casts and recorded. Results: Ovoid was the most frequent form (54%) in Iranian population. Tapered (36%) and square (10%) forms were on second and third steps, respectively. The relative frequencies of tapered and ovoid forms were equal in the mandibular arch while in the maxillary arch, the frequency of ovoid (63%) was significantly higher than tapered (27%). Conclusions: Ovoid is the most common dental arch form in Iranian population. Dental arch morphology is an important consideration in orthodontic treatment of dentofacial deformities. Understanding patient’s dental arch morphology is a key factor achieving a stable, beautiful, and functional outcome of orthodontic treatment. Keeping the dental arch form stable is suggested by many clinicians to prevent relapse (1-4). According to the literature (5), human dental arch morphology shows wide individual variation. Descriptions range from elipsoid, parabolic, a segment of circle joined to lines, a segment of circle caternary curve, etc. (6). Diagrams were subsequently designed to aid orthodontists in forming wires to shape the dental arches during the treatment. The use of standardized diagrams has been contested by some authors (3, 6), who suggested instead to use mathematical formulas to find a more individualized shape for arches (2). Clinicians tend to apply light forces through self-ligating brackets and super-elastic arch wires. Super-elastic arch wires, hardly adapt to any dental arch form (5, 6). Three tapered, square, and ovoid categories of dental arch forms have been suggested by clinicians (7) and manufacturers introduced related super-elastic arch wires. The purpose of this study was finding the relative frequencies of three dental arch forms in Iranian population, to help orthodontists preparing appropriate orthodontic arch-wires; and also measuring inter canine and inter molar widths as a guide to define treatment plan and following up the treatment outcome and compare to average of Iranian population. We examined 132 study models (66 maxillary and 66 mandibular). The models had been obtained from individuals who had passed the growth spurt; with an age range of 18 - 30; intact, complete dentition; normal dental shape and size; and less than 3mm arch length discrepancy. The models with history of orthodontic treatment; remained primary teeth; broken teeth; extended restorations to interdental contact points, cusp tips, and incisal edges; and active pathologic conditions were excluded. The models were provided by the department of orthodontics, Yazd school of dentistry, Yazd, Iran. Horizontal digital images at magnification of 1:1 and a distance of 0.5m (on basis of camera instruction) were taken by a professional camera (Canon EOS 5D Mark III, Japan) to examine dental arch forms. The most facial portion of 13 interproximal contacts on each image was marked in Photoshop (Adobe Photoshop C56) software (Figure 1). The midpoint between the mesial and distal marked points of incisors, canines, and premolars and the point at the mesial third of molars were considered as the clinical bracket points. Square, ovoid, and tapered form templates (Orthoform; 3M Unitek, Monrovia, CA, USA) were then overlaid on the images to find the best template-dental arch adaptation for each model (Figure 2). Proximity of templates to eight clinical bracket points on the left to right premolars was the criterion of adaptation. Figure 1. Points Digitized on Image of Mandibular Teeth, These points represent the most facial portions of 13 proximal contact areas. Inter-canine and inter molar widths were measured with caliper directly on the casts to prevent magnification errors of images. Inter-canine width was defined as the distance between cusp tips of canines in each jaw. Inter-molar width was defined as the distance between lingual gingival sulcus of first molars (method 1) and also mesio-buccal cusp tips of first molar (method 2) in each jaw. These measurements were done twice and the average recorded. No significant differences were found between two measurements. Relative frequencies of dental arch forms in both arches are shown in Table 1. Ovoid arch form had the highest relative frequency (54%) in Iranian population, followed by tapered (36%) and Square (10%). Table 2 shows the averages of inter canine and inter molar widths. aFrom lingual groove of first molars. bFrom mesiobucal cusp of first molars. The average of inter-canine width in maxilla was 34.65 mm and in mandible was 27.38 mm. The average of inter-molar width in maxilla by method 1 was 37.13 mm and in mandible was 30.62 mm. The average of inter-molar width in maxilla by method 2 was 54.71 mm and in mandible was 47.02 mm. Based on defendable evidence, orthodontists should first consider the anatomic limits of dental arches. In the alignment and leveling phases at the beginning of orthodontic treatment, appropriate elastic wires (e.g. 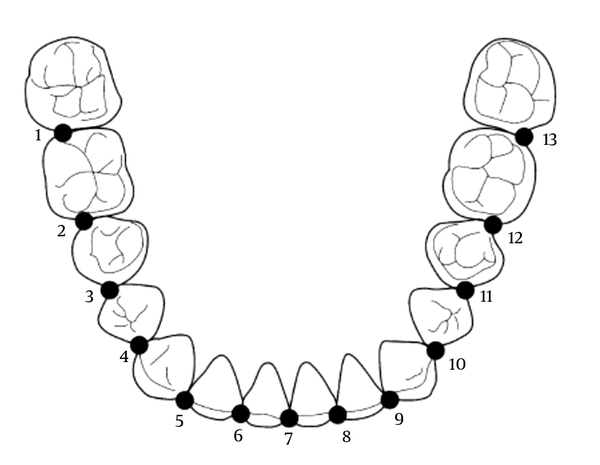 Ni-Ti) to the dental arch should be used (8, 9). Three square, ovoid, and tapered arch forms were first introduced in 1934 for treatment facilitation and improving the outcome (7). Direct measurement is the most common method among a wide variety of methods determining dental arch dimension and shape. This method, introduced by Ling and Wong (10), Lara-Carrillo et al. (11) uses caliper directly on study models. We recruited this method in the present study to measure inter canine and inter molar dimensions. Various landmarks, especially incisal edges and cusp tips have been using in the studies on dental arch form (10-12). We, however, employed clinical bracket points located at the middle of the distance between the most facial portions of the proximal contact areas of each tooth. This method, as Kook claims, is more valuable and more accurate method, in modern orthodontic treatment, than incisal edge and cusp tip method because super-elastic arch wires, which are frequently used in orthodontics, induce their function through brackets (13). Mathematical formulas are used in some studies (e.g. Braun) to show dental arch form (14). We used, in this study, the Kook and Nojima method (13, 15), and overlay method, which is subjective, to define dental arch form. The inter canine width generally increases during orthodontic treatment, and, after that, tends to become narrower than original dimension (1-4, 16). The results of this study can be used, in Iranian population, as a guide for keeping dental arch dimensions in normal range and preventing from widening. Using various landmarks to measure inter molar width has caused different results. We could not find any study comparing these results. Inter molar dimension, in this study, was measured by means of two kinds of landmarks of the first molar. Mesiobuccal cusp tip, which has been used in many studies (15, 17); and lingual gingival sulcus (transpalatal size), which is used in some studies (18). The latter method is more applicable in primary treatments, especially for maxilla. The results of our study can be used as a reference to dental arch form and changes during and after orthodontic treatment in Iranian population. In Iranian population tapered and ovoid forms were the most frequent forms of mandible (45% for each form). Square with relative frequency of 63% was the most common form of maxilla, followed by tapered and ovoid forms with relative frequencies of 27% and 10%, respectively. Based on questionnaires filled by Brazilian orthodontists, Paranhos and coworkers reported the relative frequencies of 41, 39, and 20% for ovoid, square, and tapered dental arch forms, respectively (19). Ovoid, in the report of Othman and coworkers (17), was the most common dental arch form in ethnic compared to mixed race Malaysians; and also square was the least frequent arch form in both groups combined. These results are consistent with ours. The method of our study was similar to Othman’s, though with a difference. They used cusp tips instead of clinical bracket points because of the calculus on the teeth. In a comparative study, similar to our method, Kook and coworkers found that the most frequent dental arch form was square in Korean and tapered in the northern United States populations (13). Our results, regarding two different populations, were not the same as Kook’s. The dominant dental arch form depends on firstly, the studied population and secondly, the method of study. Based on these, it is predicted that Iranian orthodontists need ovoid and then tapered prefabricated arches, and they also use the inter-canine and inter molar dimensions as a guide during orthodontic treatment. The ovoid, with relative frequency of 54%, was the most common dental arch form followed by tapered and square, respectively. Frequency of dental arch form is different between upper and lower arch. It shows orthodontist encounter more ovoid arch forms and need more ovoid form of arch wires in their office. They should not need change of arch forms and it is better to keep the arch form through the treatment.